‘Lotta Happenings — NASCAR Trucks and Indycars!! Not just a place to board your loved ones!! Click here to see what all they have to offer!! My article below appeared in the July issue of Hill Country Happenings.. Click here for more articles and information about happenings in the Texas Hill Country. birthdays around the race, Joey Coulter on the 8th and Matt Crafton on the day after mine, the 11th. 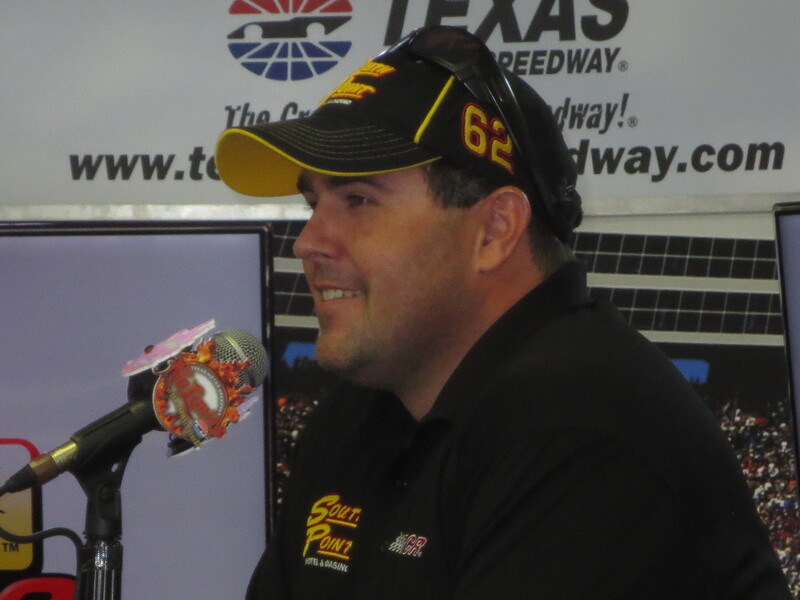 Neither one could compare to my instant favorite, Brendan Gaughan. I don’t know what attracted me — his high position in the truck series standings or his rugged, Teddy-Bear look with a smile perfect for a toothpaste commercial; I suspect the latter. He was considered a “senior” driver. When I asked him what was thought of as “old” in truck racing, he replied, “Me!” “Old” turned out to be having a 1975 birth date! Day two started with an appearance by Helio Castroneves, points leader of the Indycar Series as well as winner of Season 5 of Dancing with the Stars. 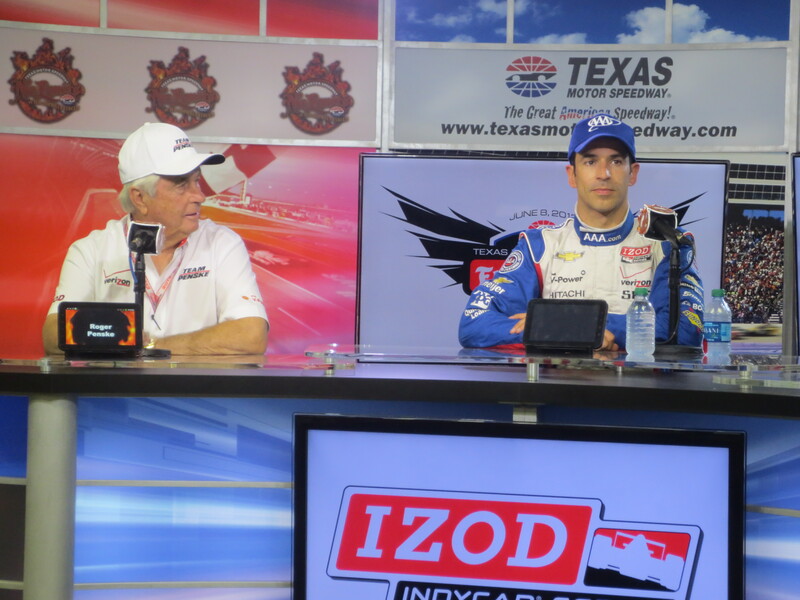 Questions from the media started with the “usual” about tire usage, downforce and grip. Rick held his breath as my hand went up; he anticipated something like, “Did you keep your yellow costume from the quick-step?” Instead, he got to proudly beam as I asked, “Helio, some NASCAR drivers have been racing in Indycars; would you ever consider crossing over to NASCAR?” He smiled. “Excellent question… If the opportunity presents itself, then I certainly would love to try. Right now I only have one thing on my mind and that is trying to win as much [sic] races as possible here and hopefully bring this championship to Roger.” (Penske Team Owner). Later, during a one-on-one with him, he confirmed that he did keep the yellow outfit from Dancing with the Stars. After Helio, a Grapevine deli unveiled three sandwiches named in honor of Mario, Michael and Marco Andretti. The three generations of Indy racers sampled the sandwiches and then the younger two departed for practice on the track while Mario stayed to chat with several of us. I was immediately awestruck over the twinkle in his eyes and how incredible he looked for his seventy-three years. He and I talked about young drivers and the importance of setting a good example for our youth. He assured me that he already had discussions with his grandson of the importance of putting his racing in front of the “glamour” life at night clubs. 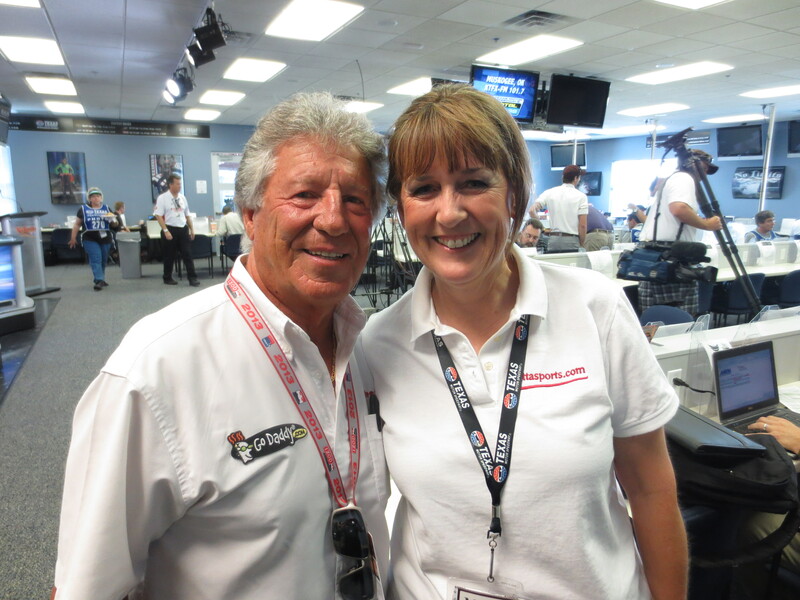 Mario Andretti & I talked the good ole’ days of real racing! After the press conference, Rick and I headed up to the start-finish line for the pace truck rides. 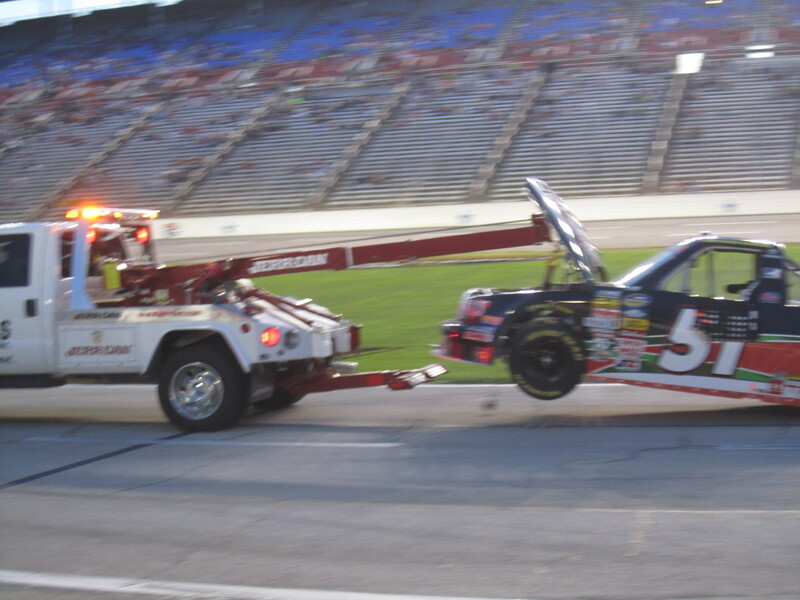 The truck was driven by Ward Burton, retired NASCAR driver and 2002 winner of the Daytona 500. Ward, in a soft, Southern drawl, inquired, “Aren’t you riding with your husband?” I explained that I had enough speed in April with the pace car and that I was going to pass. After watching Rick’s laps, it appeared that Ward’s driving was the gingerly ride I so wanted in April. Within minutes I found myself in the truck cruising around the oval track for several laps at a modest eighty miles per hour. Ward was pumped that his son Jeb was racing that evening in the truck series. It was then I found myself with a conflict — do I root for Teddy-Bear Brendan or Jeb? While I mulled my choices, the Indycars lined up to start their qualifying. It was strange going from watching pick-up trucks to seeing a flat-style car which came up to my waist and sounded like a swarm of bumblebees! A few hours later, as the sun flirted with the horizon, we found the trucks back out on the track lining up for their race. As the race progressed, daylight went to evening and the bright lights blazed the oval track while the field of thirty-two pick-ups roared around the speedway. Mid-race found Brendan leading and things looked very promising until he spun his tires on the last re-start. As his number started to plummet on the pole which listed the order of the trucks, we recognized a number in the top three. It was the #4, Jeb Burton. The final laps were very exciting as Jeb raced against the leader, Ty Dillon. It was Jeb to cross the finish line first followed by a burnout for the fans. At the later press conference it was not Jeb who the press was most interested in hearing from — it was his dad, Ward. Yes, the same Ward I took the gingerly ride with around the track earlier that day. He was beaming with pride as he told everyone that seeing his son win this race meant more to him than his (Ward’s) win at the Daytona 500. 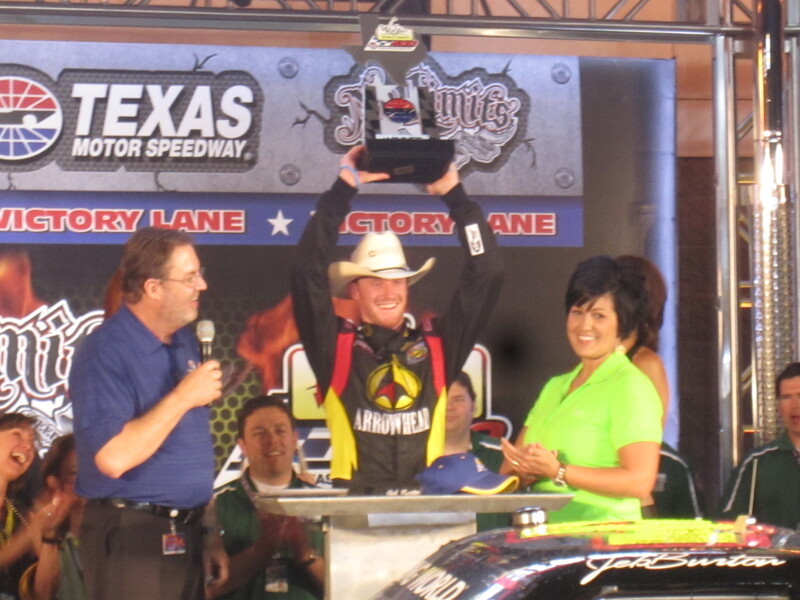 Jeb Burton won his first NASCAR Camping World Truck Series Race. Rode earlier that day with his dad, Ward Burton, 2002 Daytona 500 Winner. Day three started with an invite to ride the Indy pace car. I was getting melancholy with my birthday only two days away so I decided to “throw caution to the wind” and just do it! Since I was taping the experience again, I vowed to not repeat my expletives used during last spring’s ride. Instead, they were replaced with “Breathe …. Breathe …. Breathe” as we got up to speeds of 140 mph! I also decided that motorsports is a family affair as our driver, Stefan Wilson, had a brother in the race later that day. Further down the track, they were offering rides in a two-seater Indy car. I opted out when I saw I would need to wear a helmet. It would only mess up my ponytail or maybe it was hearing that I would have to be strapped into the car because of the speeds of almost 200 mph! 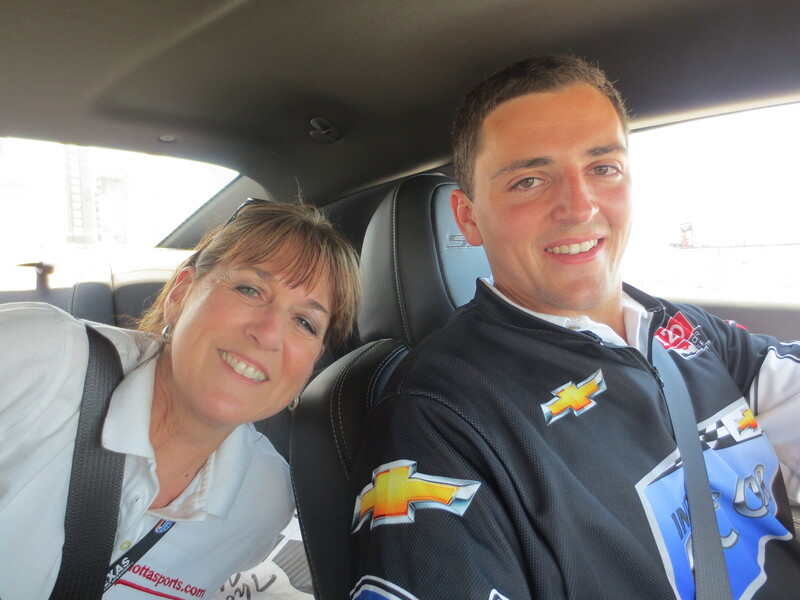 Pace Car ride with Stephan Wilson This was faster than last April’s! Video on Lotta Sports on Facebook. Stephan’s brother is Justin Wilson racing tonight #19. A more serene setting was in the media center where I got to meet two teachers from Moore, Oklahoma and a firefighter from West, Texas. They had been invited to the race to do the “Start Your Engines” and the flag to begin the race. It was a very emotional thirty minutes as they relayed their experiences from the tornadoes and the fertilizer plant explosion. After they left, two members of the PBR (Professional Bull Riders) presented Indy 500 winner Tony Kanaan with a certificate of a bull TK500, named in his honor. The bull, formerly known as Mud Wasp, has been successfully ridden only four times! 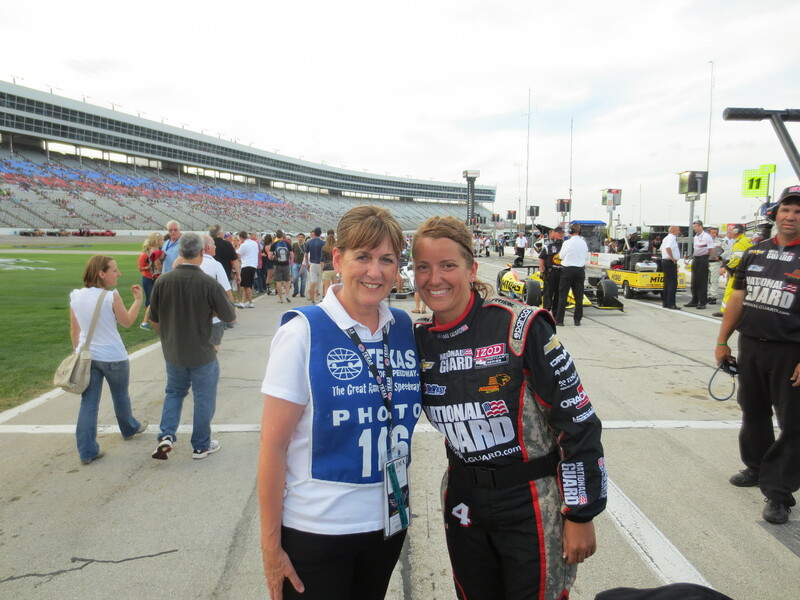 During the Indycar pre-race ceremonies, I met the only female pit member. Her name was Anna and she was the rear-jack for National Guard Panther Racing #4 car. I commented that I thought it would be neat to do something like that, but I was too old. “Never give up on your dreams,” she advised me. There was only one person left on my radar and it was someone I had not seen since the mid-70s when I worked flights between Houston and Indianapolis. 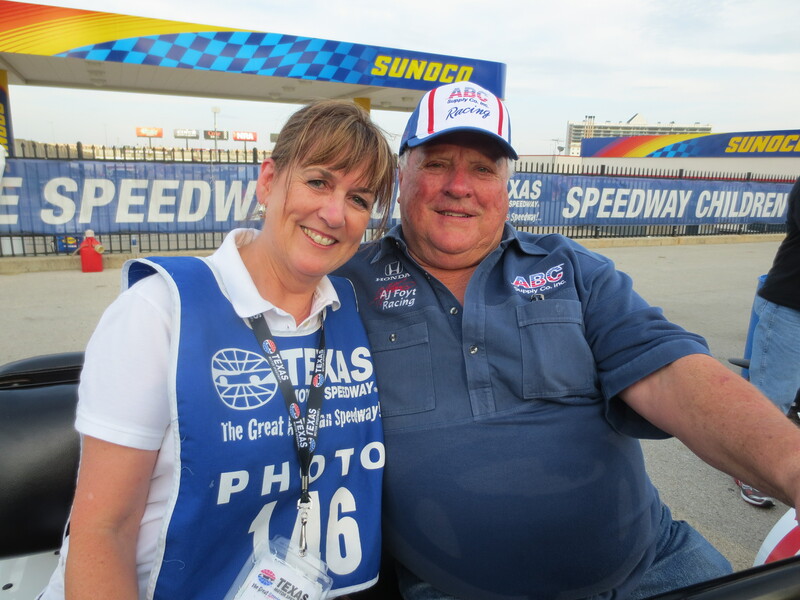 As I proceeded down the line of pit crew canopies, I spotted him – racing legend and now owner, A J Foyt. He was seated in a golf cart in the #14 car’s area. I had already met his assistant, so when she saw me, she motioned me over. Moments later, I was on the cart talking to A J about the year I worked his charter to the Indy 500 and we watched the race in the rain. And as if seeing AJ wasn’t exciting enough, a third of the way through the race I ran into former Texas Rangers catcher, Pudge Rodriquez. The day before he had been named to the Rangers Baseball Hall of Fame so I congratulated him. I had not seen Pudge since I worked the baseball charters in the early 90s; he had not changed at all. As it was the night before, the race was exciting. Mario Andretti’s grandson Marco led the first part of the race. He and two other drivers kept the lead until Lap 97, when Helio Castroneves took over and kept the lead until the race ended at Lap 228. For me, I was torn between which was better — that night, or the night Helio won the Dancing with the Stars competition. Hmmmm… a blue and red helmet or dancing shoes? I guess it just depends on one’s sports perspective, and that’s Lotta Sports!